VICTORI + MO hosts a talk with artists Leah Guadagnoli and Alex Ebstein to discuss how they approach their individual art practices. The two artists recently were part of a two-person exhibition Cut, Copy, Paste: It’s Not What You Think at Terrault Contemporary in Baltimore. The talk is held in conjunction with Leah Gugagnoli's exhibition I Just Want to See You Underwater currently on view at VICTORI + MO. Alex Ebstein is an artist, curator, and critic based in Baltimore, MD. She received her BA in Studio Art from Goucher College in 2007 and a MFA from Towson University in 2015. 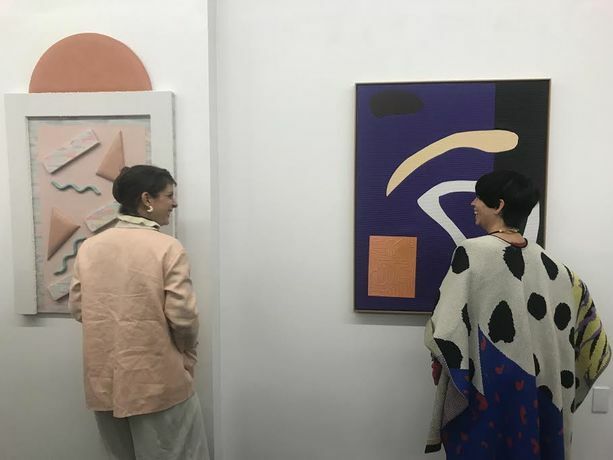 Her work has been exhibited in solo shows at Cuevas Tilleard in New York, NY and Futta Gallery in Rome, Italy. Recent group exhibitions include The Shared Patio at Greenpoint Terminal Gallery in Brooklyn, NY; After Image at Loyal Gallery in Stockholm, Sweden; Jade at Central Park in Los Angeles, CA; and Implicit Horizonat Mixed Greens in New York, NY. Leah Guadagnoli lives and works in Brooklyn, NY. She received her MFA in Visual Art from Rutgers University in 2014 and her BFA in Painting and Art History from University of Illinois at Urbana-Champaign in 2014. She has had solo and two person exhibitions at 247365 (New York, NY) and Sadie Halie Projects (Minneapolis, MN), and most recently at Terrault (Baltimore, MD) with Alex Ebstein. Her work been included in group exhibitions at White Columns (New York, NY), Harper’s Books (East Hampton, NY), Asya Geisberg (New York NY), Cuevas Tillard (New York, NY), Ortega y Gasset (Brooklyn, NY), Deli Gallery (Brooklyn, NY) and Library Street Collective (Los Angeles, CA), among others. Guadagnoli has received support from Yaddo, The Lighthouse Works, Vermont Studio Center, The Wassaic Artist Residency, Tilleard Projects in Lamu, Kenya, The Macedonia Institute, and The Ora Lerman Charitable Trust. Her work has been reviewed in New American Paintings, Art F City, Hyperallergic, Maake Magazine, and Bmore Art. She is the founder of the Maple Terrace Residency Program in Brooklyn, NY.